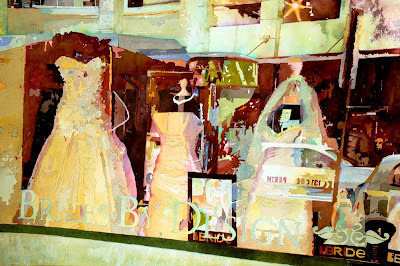 "Brides by Design" received a High Commendation at the City of Melville Art Awards last week. Not quite the same as last year's top honour but it's great to get a nod of approval from ones peers. Oh Congratulations David, i remember this wonderful painting very well! Always wonderful to share in news such as this. I'm tempted to say nice judging, but I have a feeling you should have taken first prize again. Honestly....am I right? Hey thanks Isabelle, this painting lacks the spontaneity like so much in your drawing. It was the thought out and carefully painted Vs the bravura approach which won the judges this time. Thanks Joel, I like the painting myself but can't say it was the most enjoyable one to paint. It may well be the last of it's kind for me...the jury's still out as they say. Cheers Nick, "nice judging" ...I don't know. I guess they adopt a school of thought or a "default" position when the choice isn't easy to make. They're also judging several other categories of media. The w/c winner was a pretty loose bravura street scene of a well known cafe strip in Fremantle. It was probably in a style judges were more accustomed to in a watercolour. G'day Clive, I do appreciate you taking the time to take a look. Congratulations David...I really love this painting and I am pleased for you. However,I am surprised it didn't take out the top prize. I am with Nick on this! the palette on this one melts in the mouth. Hoping something new is on the easel Dake! Nice to see you Sandy. By now you would be in Darwin I expect. I'm sure you loved the Ghan and the awesome landscape of the centre of the country. Nicholas, thanks, this is the boss of the series and it's the palette that probably makes it much deeper than many of the others. Only one from this series has sold and that was to a public organization. I'm doubting whether they suit a domestic market. This is probably the last of the Windows. I've painted nothing new that I can show here. An no new "theme" right at the moment. excellent David, a smart view of the objects trough the window and the city reflections! Congratulations Dake. I have always enjoyed your work. Hi Pauline, nice to hear from you! Your Mothers Day painting is a total killer! Hey Alex, thanks for coming over mate, always good to hear from you. Will swing on by to your site shortly. Deb, what a surprise, I thought you disliked me. I trust you're doing fine and enjoying your painting. Congrats on your recent award for this watercolour from your outstanding window series. Also a win-win in having a corporation acquire the work for their public collection! I totally agree with Nick's comment about the incredible colour palette here, and, its originality, the chromatic variegation and luminosity/reflectivity within a free-form semi-abstracted context: it's a watercolour feat. It's a better blog world with you in it Wayne! You on break David? Sometimes that is a requirement before mounting the next campaign.. I imagine great projects in the pipeline. Hi Bill, I can't say I've really given it a break. Just nothing I want to display. I have been in the mine looking for a vein. Questioning almost everything I've been doing. I know it's not all been lousy but just too the same! Fabulous! I can see why this painting won a top award. David - I think this is outstanding! It deserves top honors! I love scenes that are made better by awesome color and an artsy approach.